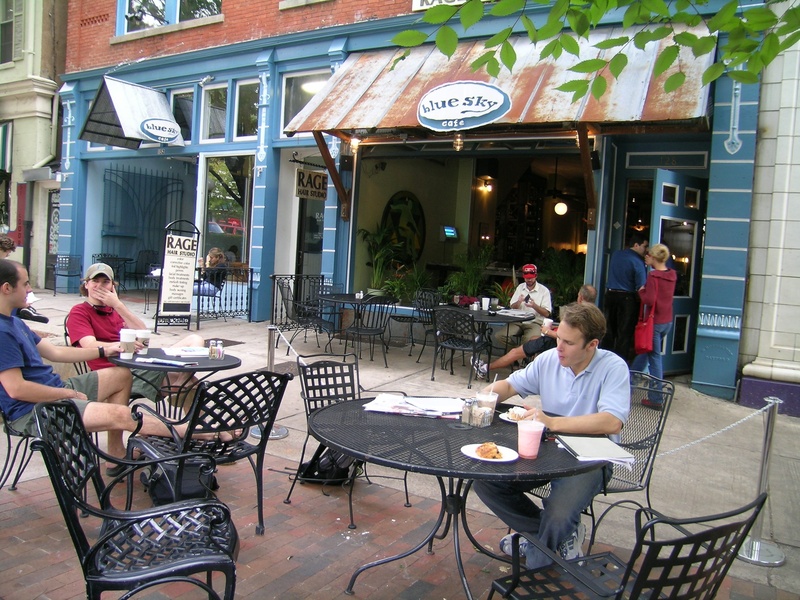 This is the coffeehouse ‘David’ in Athens, Georgia, Blue Sky Cafe, an independent, long-time institution and favorite hangout. I assume there’s no need to tell you what the coffeehouse Goliath* is that opened up right next door, with little sympathy and remorse if they had put Blue Sky out of business. Well, the good news is that Blue Sky expanded and is doing better than ever after that certain chain next door opened. Why? Because in addition to being a great coffeehouse and cafe, it has a bar – two of them, and a downstairs lounge for night dwellers. 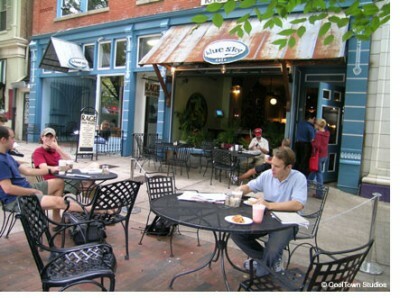 Because the front of the building opens up to outdoor seating for a true fresh air experience. Because there’s free live music, and Blue Sky participates in local events. Because when you walk in, you know there’s no place like it anywhere in the world. The main reason? Because the people who work and frequent Blue Sky simply seem way more independent than the ones next door. *You know, the coffee chain that’s on every block in every town. how do indie businesses compare to corporate chains in their ability to offer just wages and benefits to their employees? can they compete in this arena as well? are there cooperative means by which local businesses in athens can offer these incentives/necessities to their employees? seems it would be worthwhile knowing what the city is doing in this regards. Do you have a higher resolution picture of the Blue Sky picture above? I am going to get the building painted and need to focus in on the rosettes at the top of the columns.